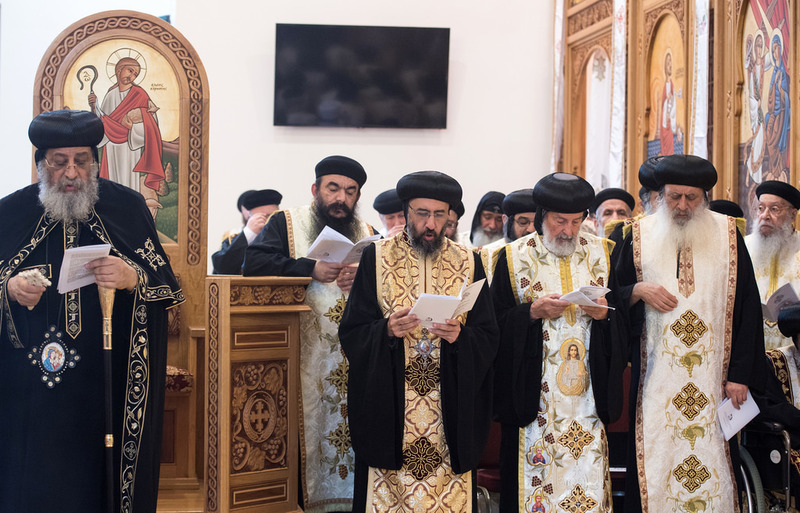 As part of the first pastoral visit of His Holiness Pope Tawadros II, 118th Pope of Alexandria and Patriarch of the See of Saint Mark, an official vespers service was held in his honour at the Coptic Cathedral of Saint George in Hertfordshire. 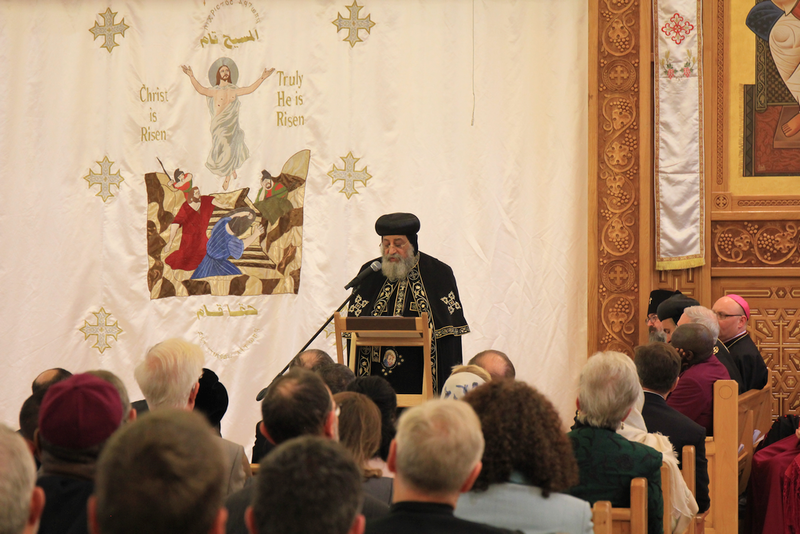 The event was held on 6 May 2017, following a gathering earlier that day of over six hundred Coptic youth from across the UK, who listened to a sermon by His Holiness on ‘the Cross and the joy it brings.’ There were also presentations from two youth choirs, both traditional and contemporary, along with video presentations outlining the various ministries that fall under the umbrella of ‘Coptic Youth Mission’. His Holiness also officiated a Eucharistic service at the Cathedral of Saint George on Sunday 7 May 2017. His Grace Bishop Angaelos, General Bishop of the Coptic Orthodox Church in the United Kingdom, gave an introductory welcome at the start of the official vespers service, which was attended by members of the House of Lords, the Diplomatic Corps, the Foreign Commonwealth Office, the Home Office, humanitarian and advocacy organisations, and various ecumenical and inter-religious guests. We are blessed as Coptic Christians, because of the witness of Your Holiness and our sisters and brothers in Egypt. We are blessed because of your goodness, strength, faithfulness, and forgiving nature; and because of the life of Christ that is vibrant and alive in the midst of an often-increasing darkness. We are being persecuted by some who do not want us to remain in the Middle East, but it is by no means the majority of Egypt. We have seen police officers, soldiers and simple men and women, not only Christians but Muslims, also dying. This targeting is of a cohesive way of life. You are an inspiration, role model, guide and father, and we thank you for joining us here, and give thanks to God for your continued witness. A message from The Right Honourable Theresa May, Prime Minister, was read during the service, followed by a fraternal message from The Most Revd and Rt Hon Justin Welby, Archbishop of Canterbury, read by The Right Reverend Christopher Chessun, Bishop of Southwark. Your Holiness, we live in testing times. The suffering of Christians in Egypt has been acute in recent weeks. I am grateful for the witness of steadfast bravery and hope that you have shown. Your fellow Christians are strengthened by your faithfulness to the proclamation of the Good News of Jesus Christ and by your unswerving commitment to the worship of the triune God. It is a great honour for me to be here today and a blessing for us all to gather together. This is a fulfilment of our Christian calling, which is to keep the “unity of spirit in the bond of peace” (Ephesians 4:3). 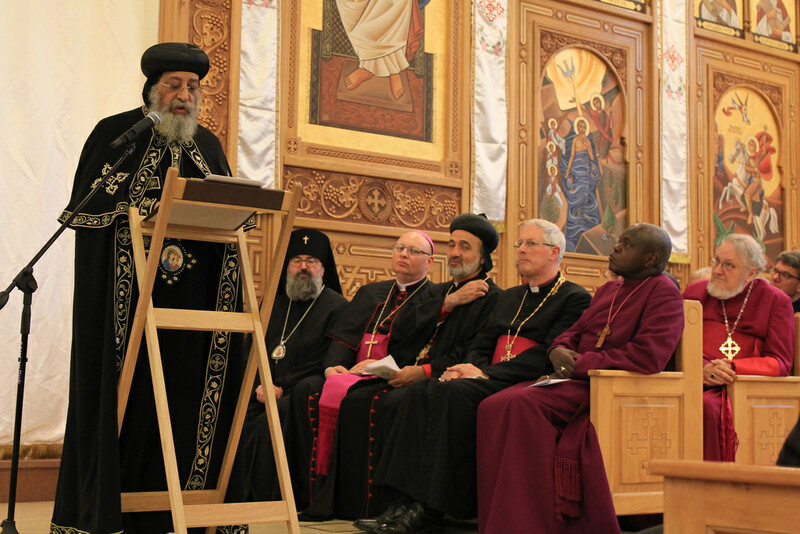 His Holiness spoke of the role that Egypt has played historically in its contribution to Christianity. In the same way Coptic Christians have given their lives in martyrdom throughout the ages, they continue to be killed for their Faith today. Both teachings and martyrdom have contributed to the preservation of the Christian Faith. We were all blessed by the visit of His Holiness Pope Francis to Egypt, and these visits, along with many others from sister Churches, make for continued good relations between our Churches, and also shed light on the rich history and ongoing role that Egypt has to play. The world today has become more hungry for love, especially as the life of technology has uncovered every aspect of the human being. In other words, the relation of man to machine became superior to the relation of human to human. This dynamic has contributed to the increased violence and terrorism we experience in our world today. Together we must work to present the love of Christ for everyone, in any place, at any time. Therefore, we in Egypt depend on the words which Saint Paul, who instructs us that ‘Love never fails’ (1 Corinthians 13:8). Our relations, whether inside or outside Egypt, must depend on the notion that ‘love never fails’ and we must present love in action. 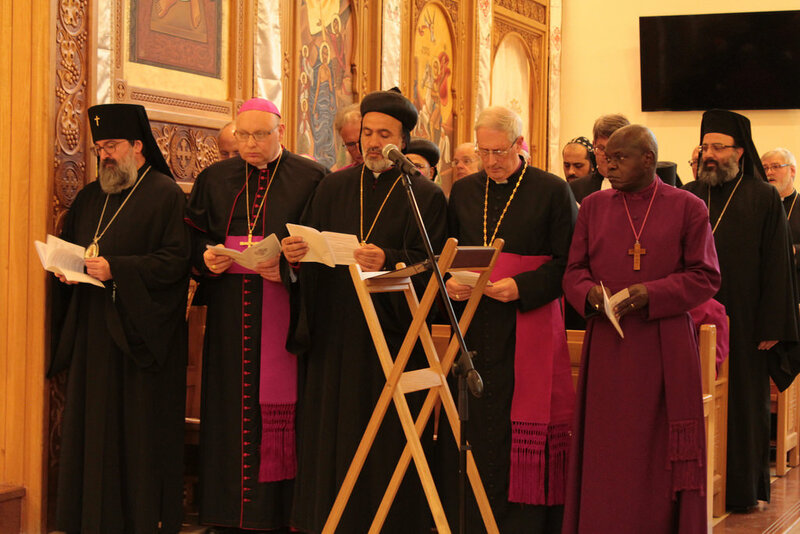 Addresses were also delivered by The Most Revd and Rt Hon John Sentamu, Archbishop of York, His Excellency Mr Nasser Kamel, Ambassador of the Arab Republic of Egypt to the United Kingdom, His Eminence Mor Athanasius Toma Dawod of the Syrian Orthodox Church, Archbishop Kevin McDonald, Co-Chair of the Catholic-Oriental Orthodox Regional Forum, and His Eminence Archbishop Elisey of Sourozh, Primate of the Russian Orthodox Church in the United Kingdom. 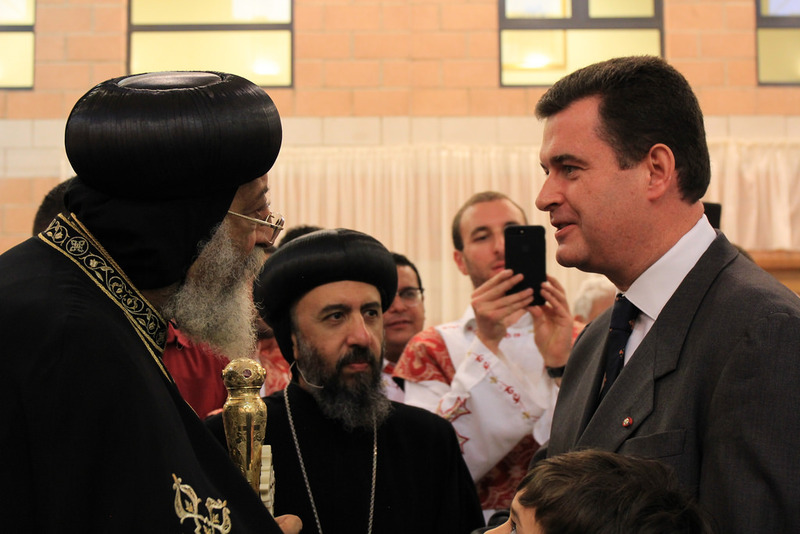 The service was followed by a reception at which guests conversed with His Holiness and met members of the Coptic Orthodox community. 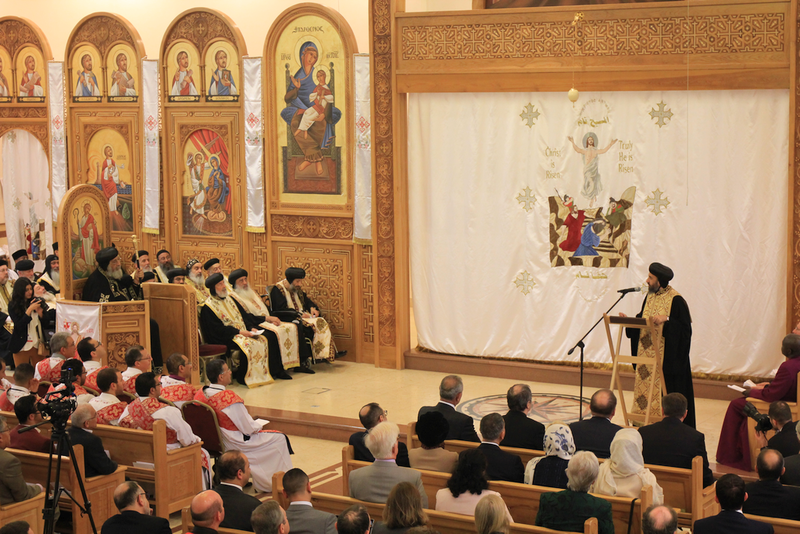 His Holiness will visit Coptic Orthodox parishes across the United Kingdom, officiating liturgical services and performing several consecrations, while generally taking time to engage with parishioners. 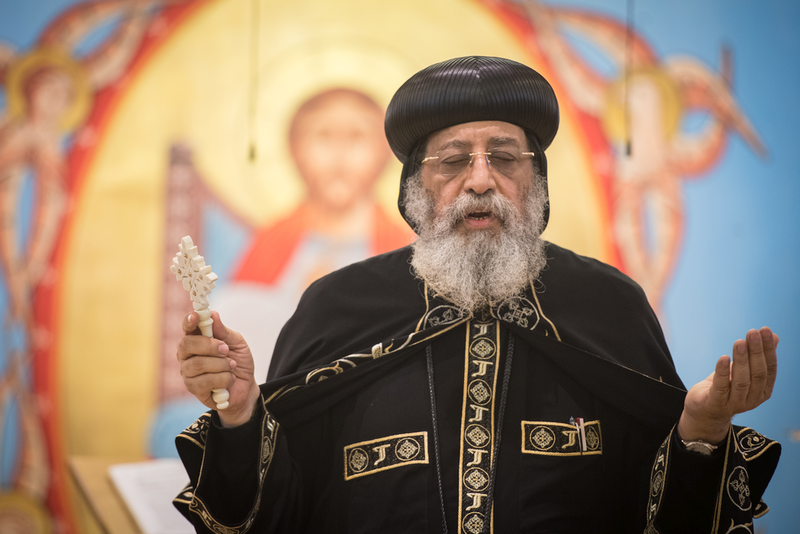 Pope Tawadros will also engage with various ecumenical, interfaith and official members of British society at a series of events planned throughout the course of his stay. 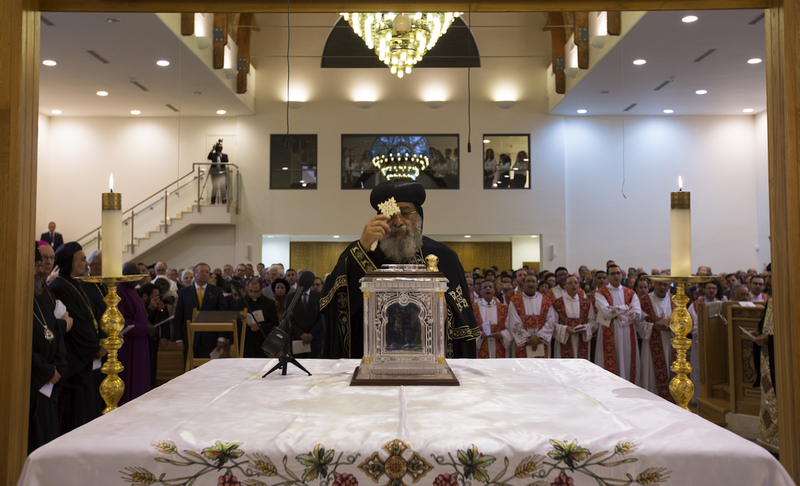 0 Comment(s) to the "Official Vespers & Reception for HH Pope Tawadros II in the UK"